Tucked in the back of TSR's Supplement II Blackmoor is a curious expansion on the sage NPC. It's curious because this section contains quite a bit of detailed information about an NPC type who's only function would be as a one off hire to research an answer to some obscure question the PC's might have once or twice in a campaign. None of the other specialist hirelings are treated this way, and there really is no practical reason any of them should be. This detailed expansion of the Sage NPC is unusual, and seems even stranger when you consider that the sage's main function, researching obscure questions, is also well within the purview of Magic-users. Use of a sage must surely be rare in most campaigns, so why is the sage, and only the sage, singled out for a detailed write-up in the Blackmoor Supplement? When discussing his work on Supplement II Blackmoor in his Dragonsfoote Q & A forum, editor Tim Kask reveals that he cut sections of the material Arneson had written ("I said to hell with that and threw most of the crap away"). Kask considered the discarded material to be redundant or non-conforming to the rules of D&D. Some other portions of Arneson's manuscript weren't discarded, but were reworked by Kask for the same reason. In particular, Kask has pointed to the Assassin and the Sage as being reworked in this regard. Kask thought the Assassin was "more suited to be an NPC, but was overruled." With the Sage in Supplement II, however, he appears to have not been overruled. This list is particularly interesting regarding the dating of the Special Interests section. It is abundantly evident from the content throughout the piece that the section was written after the January 1974 publication of D&D, but exactly when is more difficult to ascertain. The class list however provides some solid ground to reason from. In addition to the three original classes, the list contains the Paladin from, Supplement I Greyhawk, (January 1975) the Ranger (Strategic Review #2, Summer 1975). Tacked on to the end are the 3 "classes" associated with Blackmoor. Setting those last 3 aside for the moment and looking specifically at Fighting man to Paladin in the SI list, we find what would be an up to date player character class list for the summer/fall of '75, except that the "Thief" from Supplement I is missing. 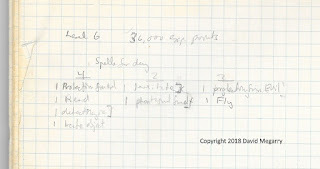 In his Corner of the Table newsletter for August of 1975, Arneson informs the readers that he has just completed months of work on Supplement II. Supplement II, of course contains 2 of the 3 "Blackmoor" classes on the end of the SI list - the Assassin and Sage - so only Merchant is missing from the material TSR published up to that time. It seems quite probable, therefore, that the section containing the Special Interests piece was originally part of the material Arneson wrote that summer, which Kask subsequently considered unfit for publication in Supplement II. This isn't so surprising, as the SI section substantially changes the rules for experience points. Kask may well have thought it too rule-bending to be published as official material. It's unclear if Arneson had also submitted a piece on the Merchant class, but if so it seems to have likewise fallen victim to Kask's editorial process. The fact that Thief is missing from Arneson's SI class list suggest that Arneson may have considered Thieves and Assassins to be equivalents, or perhaps he considered Theives to be a subclass of Assassin (instead of the reverse) or perhaps a replacement. Whatever the case with Assassin and Merchant, the reason the Sage gets such oddly detailed treatment in Supplement II would seem to be that Kask took what was intended to be a class and turned it into an NPC because he didn't think it was a suitable class. That means that, theoretically, one could cut away all the text specifically discussing the details of hiring a Sage, and be left, more or less, with the specifics unique to the class, to a greater or lesser degree as Arneson originally wrote it. Before we begin this exercise, we should ask why Arneson created a sage class in the first place. The adventuring "Sage" isn't exactly an obvious literary archetype, unlike the Assassin (hello Assassins of Gor ) but, just as with the Cleric and the Merchant, we do have a well established character in play in pre D&D Blackmoor who could well have served as the model for a Sage character class. That character would be David Megarry's Scholaress. The "Earl's Scholaress" began life as a pre-D&D character of what we would now think of as the Fighter class, being neither Priest or Wizard and being well armed. In one particular adventure the "Scholar" character used a magical bracelet to change into a basilisk (female), and much to his chagrin, found himself a herself upon changing back to human. Thereafter, the Scholaress increasingly researched and used magic. 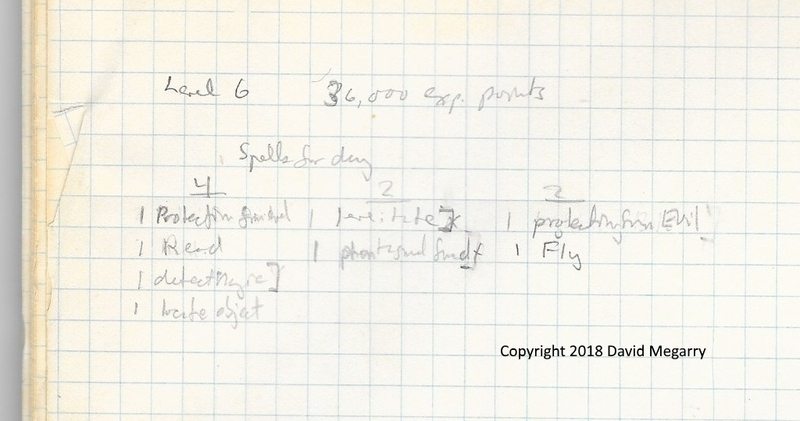 At one point after the rules of D&D were available, Dave Arneson had the Scholaress progress as a Magic user for XP purposes, and allowed her use what David Megarry characterized as "non-weapon" spells, as shown in the illustration below from Mr. Megarry's chemistry notebook. The Scholaress was a magic user, but she was a magic user who had a limited spell repertoire and who wore armor and used swords. The Scholaress, for all intents and purposes was a new subclass of MU. Even though the connection appears quite obvious, at this point we can't, of course, know for certain if the Scholaress was really the inspiration for Arneson's Sage, but for now, let's assume so. Sages are a type of Magic-user who are members of a very powerful Guild dedicated to the study of knowledge. Each sage will have at least one category of specialization. Sages with a higher Intelligence score (see below) may pick between being exceptional in one category or average in two. Sages with an intelligence of 18 will have all three categories thoroughly studied. The table of below indicates the chance which the sage has of being able to answer any given question within their category of knowledge. Each time a question is asked of the sage the referee will roll the percentile dice. A score of less than or equal to the base number, with bonuses and penalties considered, will indicate that the sage is able to give a relatively accurate answer. Any question outside of the Sage's category of specialization are treated as below average knowledge and thus given a base 20% chance of success. Subjective adjustments will be made by the referee for the relative difficulty of the question based on the overall setting for his campaign and general knowledge appropriate to the setting. Very difficult questions will require time, for the sage must consult their various books and such, work in their laboratory, and so on. Time can range from one day to many weeks, depending on the difficulty of determining an answer — providing one can ever be found — and funding of the study might be required by the referee. Add 5% to chances if a library is readily available. For every 50,000 gold pieces spent in equipping a sage, from 1–10% will be added to his base score, subject to a maximum of 50%. Note that the referee will not reveal when this maximum is reached. For every 100,000 gold pieces spent on areas outside the sage’s basic category there is a 25% (cumulative) chance that he will be able to add the category to his knowledge; thus a sage can be brought to know all three categories with an expenditure of 800,000 gold pieces. There is a slight drawback other than cost, and doing so will raise the Sage's Intelligence score accordingly. The Sage must spend an average of one month of study time in order to assimilate/employ an investment expenditure of 10,000 gold pieces, either in order to increase his base score or the fields of knowledge. Sages do not learn "weapon" spells, that is spells like Fireball, that cause offensive damage. All other spells are open for them to learn exactly as with any type of Magic-user. As a consequence, Sages rely on spells to a far lesser extent than other Magic-users, and will frequently be found to wear armor and carry metal weapons when adventuring. As with all Magic-users, these martial accouterments must be removed for safe spell casting, but since sages almost never cast spells in combat, it is rarely an issue for them. Sages are able to cast curses when close to death or dying. The power of the curse depends upon the knowledgeability of the Sage. A very low-level one might curse a person so that all of his teeth fell out, while a very high-level one could curse you so as to never be able to make a saving throw again! A normal curse removal would not work to remove a sage’s curse, but some form of Cleric assigned quest might.